Has everyone got their cards done for the Dad’s in their life? I got mine done, but I’m late as usual. I did have a few other Father’s Day cards finished that I had created for the Coffee Lovers blog hop but they were not good enough for my dad. So here it is, I sure hope he loves it. To start I colored the lion and cubs using Faber Castell Polychromos pencils. 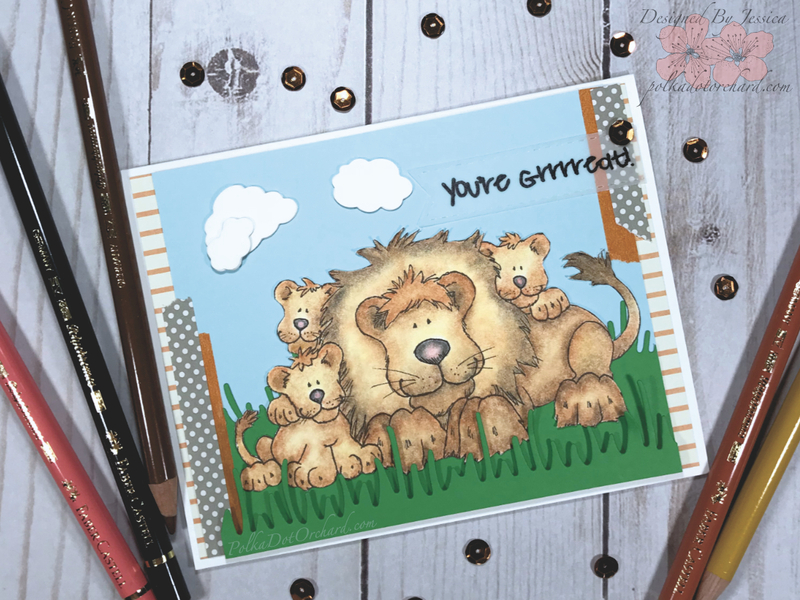 The adorable lion family is freebie digi by Whimsy Stamp. I did lots of color layers and lots of blending with gamsol to get the look I wanted for the lions. 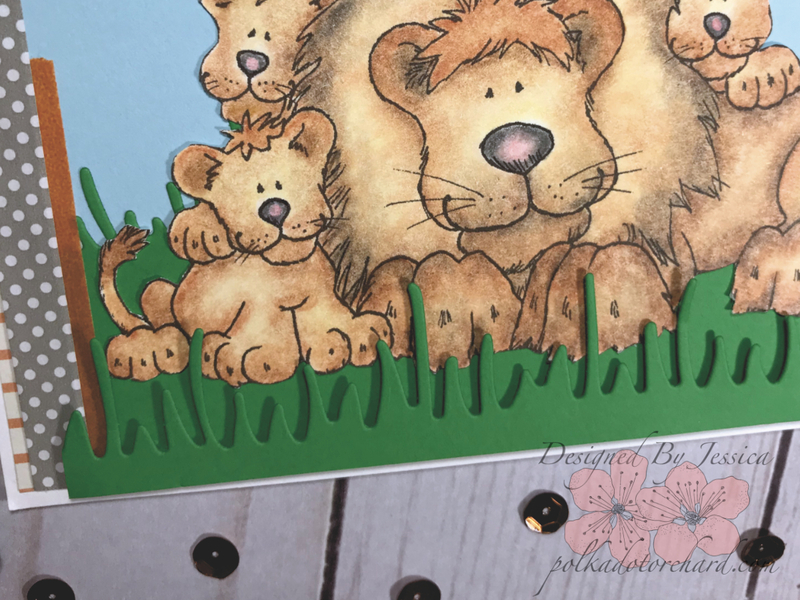 Then using mini Tim Holtz scissors I fussy cut the lion family. I then got busy die cutting with my Sizzix BIGkick. I cut the grass using Lawn Fawn “Meadow Boarders” Die and the clouds using My Treasured Kutz “High and Mighty Clouds” die. The clouds I actually cut four times and glued them together to make them pop off the card. I also cut a small stitched banner from some vellum that I later stamped the sentiment “You’re Grrrreat!” from the Jaded Blossom stamp set “Go Wild”. I stamped it in black Stazon ink which is about the best ink for vellum, unless you use embossing powder, then any sticky ink will do. 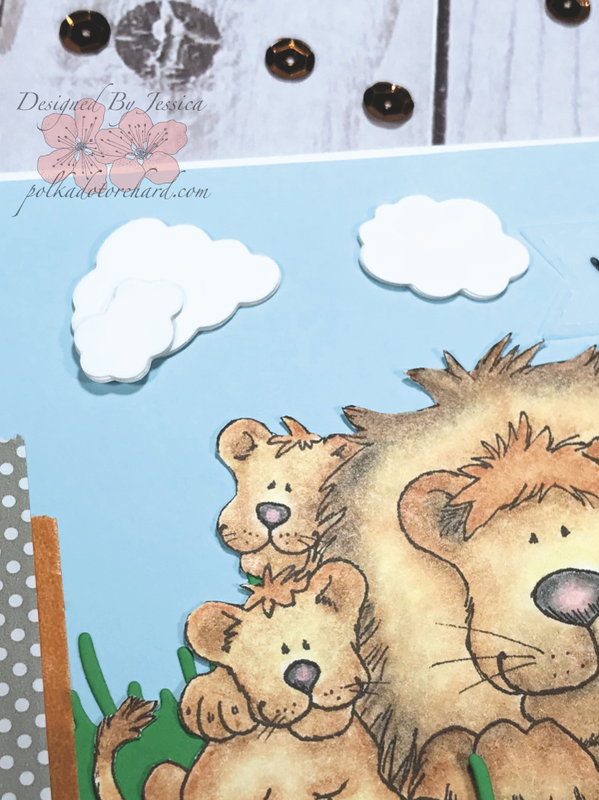 I attached my craft stash pattern paper, blue cardstock, grassy hill, and lion family using an ATG tape gun. The straight piece of grass was attached with some foam adhesive to give it a bit of dimension. For the clouds I glued them down with Ranger Multi Medium Matte glue. I also used a little of the Ranger glue to attach the vellum banner, only adding small dots behind the stamped letters. To add just a little extra to the card front I did add some washi tape. I then added my final touch of one piece of orange sequins, because no card is complete until it has a touch of sparkle. Of course, I need the inside to coordinate with the front. To do this I layered the same papers used on the front on the inside, only adding a sentiment panel (a place to write something nice). I even added a strip of grass to the bottom of the sentiment panel which I thought was a nice touch. The sentiment “ALL I CAN SAY IS THANKS FOR EVERYTHING” was actually pieced together using words from the Honey Bee stamp set “Thanks and Giving”. Which was stamped in Versafine Onyx Black using my trusty MISTI. It needed just a bit more so I added some washi tape to the inside as well. Now the card is done and the front and inside match perfectly. OK, so I decided to take this card a bit further and add some fun stuff to the envelope using a Jaded Blossoms stamp set called “Funny Mail”. 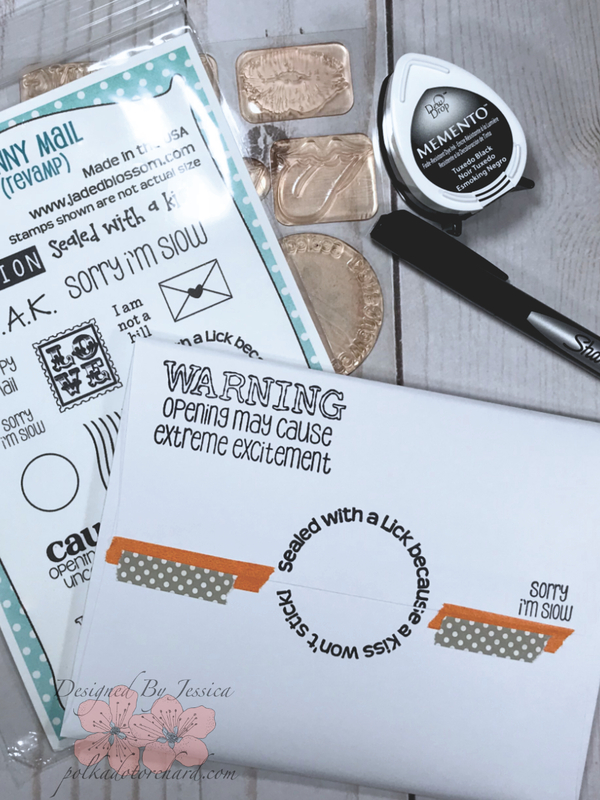 I used my MISTI and some black Memento ink to stamp all the funny stuff and then I added a bit of washi tape. I think my dad will love this. I did want to tell you, when I write inside my cards sometimes I use a Sharpie pen because this particular pen does not bleed through paper. 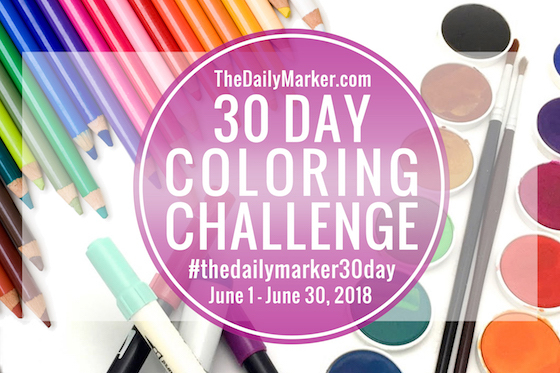 This is an adorable card… and your coloring skills are amazing! Thank you for playing along in our Crackerbox and So Suzy Stamps challenge!